On July 1, federal agents from the the FBI, IRS and Homeland Security raided the Institute for Islamic and Arabic Sciences in America, a Saudi-created school in Merrifield, Virginia. 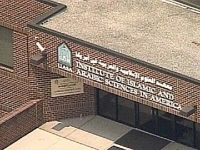 The Institute for Islamic and Arabic Sciences in America, a Saudi-created school in Merrifield, Virginia. The Washington Post: "Arsalan Iftikhar, legal director for the District-based Council on American-Islamic Relations, or CAIR, said an institute staff member called CAIR attorneys while the raid was underway. ‘They said they had no idea what was going on,' said Iftikhar, who went to the scene and talked with agents from the FBI and U.S. Immigration and Customs Enforcement." NBC: "An attorney [later identified in the same report as Arsalan Istikhar of CAIR] who said he was from a Muslim civil rights group appeared on the scene to ensure that no rights were violated." The Associated Press: "Lawyers for the Council on American-Islamic Relations observed the raid." The Connection: "Rizwan Mowlana, the executive director of the Mid-Atlantic Chapter of the Council on American Islamic Relations, said the FBI had told him Thursday morning the raid was going to take place." testified that a TV reporter tipped him off to a federal probe of Maali a month before the arrest. Answering questions from Assistant U.S. Attorney Cynthia Hawkins, NeJame identified Tony Pipitone, a reporter at WKMG-Channel 6, as the source of his information. Pipitone, who has covered the Maali story since it broke, attended Tuesday's hearing but did not report on it. He later said NeJame "told the truth, under oath."